Turn your knitting on its side with Mathew Gnagy's workshop video for knitting sideways. Join knitwear designer Mathew Gnagy on the new Knitting Daily workshop that explores the design methodology of knitting sideways, the benefits of doing so, and much more. Following the success of Mathew Gnagy's book Knitting Off the Axis (Interweave), this new Knitting Daily Workshop Sideways Knits brings Mathew's designs to life as he shares his pattern construction and design aesthetic with knitters of all skill levels. Mathew Gnagy began his career by designing clothing and costumes using paper patterns, so naturally when he dove into knitwear design he looked at construction differently. In this workshop, he'll show examples of sideways constructed sweaters while discussing pattern placement, fabric stretch, directional interest, easy shaping techniques, and even inspirational moments where designing is better on its side. How to recognize textural stitches and cables that create interesting "reads" when turned on their sides. 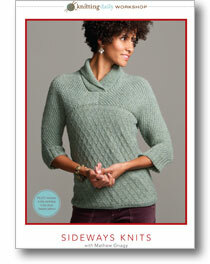 How to choose patterns that can be knit successfully on their sides. Tips and tricks for dealing with challenges that come with sideways knitting. Plus! Included with this workshop is a free pattern for Mathew's Jesse Sweater, so you can practice your skills. With Mathew as your guide, you'll soon be knitting sideways and enjoying the many design benefits to sideways knitwear construction!